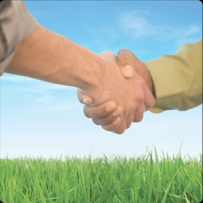 At Bauermeister Tree our clients trust us to provide an expert tree service to protect their most precious natural assets. Bauermeister Tree is building a reputation of excellence by exceeding your expectations both in Quality and Service. Allow our team of professionals to ease your worries knowing that the job will be done safely and efficiently. Click Here To get Your Free Estimate!! Tree's are very unpredictable. 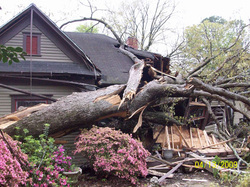 Wind and weather may cause tree's and branches to fall and leave you in a tight situation. With our 24 hour emergency service, our well trained arborists can be on site and get you back in a safe environment at any hour. Call (260) 466-0968!! Heard About Emerald Ash Borer? 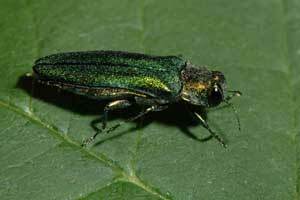 The emerald ash borer (EAB), Agrilus planipennis, is a very destructive insect pest of ash trees (Fraxinus spp. ), the only known hosts of this borer in the United States. This exotic borer is a native of Asia with its natural range including China, Japan, Mongolia, Korea, the Russian Far East and Taiwan. This little guy is still plaguing the ash tree population. See our full page for more Information. 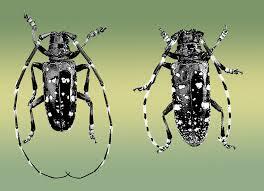 ​ The Asian Longhorned beetle (ALB) has been discovered attacking trees in the United States. Tunneling by beetle larvae girdles tree stems and branches. Repeated attacks lead to dieback of the tree crown and, eventually, death of the tree. ALB probably travelled to the United States inside solid wood packing material from China. The beetle has been intercepted at ports and found in warehouses throughout the United States. This beetle is a serious pest in China, where it kills hardwood trees in roadside plantings, shelterbelts, and plantations. In the United States the beetle prefers maple species (Acer spp. ), including boxelder, Norway, red, silver, and sugar maples. Other preferred hosts are birches, Ohio buckeye, elms, horse chestnut, and willows. Occasional to rare hosts include ashes, European mountain ash, London plane tree, mimosa, and poplars. A complete list of host trees in the United States has not been determined.